I'm very excited to again this week join a talented group of women who connect each Friday in an online, unedited flash mob free write based on a one-word prompt from our fearless leader Kate Motaung. My timer is set for 5 minutes; let's see where the word "expect" takes me. I doubt there's a person alive who can, after pausing to consider where they are and what their life is like, say that they are exactly where they thought they would be at this point in their life and everything is just as they expected it to be. Life simply doesn't turn out the way we expect, does it? Sometimes the unexpected is welcome. The individual who finds him/herself in a career they never would have dreamed of. The couple who discovers that, despite their worst fears and expectations, they can not only retire comfortably, they can retire at a younger age than they had anticipated. Sadly, the unexpected can bring with it pain and sorrow. The loss of a loved one or a job or a home; a chronic physical condition that significantly alters a person's quality of life; the loss of a long-cherished dream of being a biological parent. Focusing on the shattered expectation, squandering the unexpected windfall . . . both are unhealthy. It doesn't matter whether reality exceeds or doesn't meet our expectations; either way, the unexpected requires adjustments and adaptation. The unexpected requires that we prayerfully and honestly and open-mindedly consider how to live on the new course our life has taken. The individual whose physical condition limits their mobility must decide how to spend the time that was previously spent going to work, out with friends, etc. The couple who discovers they have unexpected financial resources has the privilege of deciding how best they can utilize those funds. So . . . where am I today? Where are you? Bitterly dwelling on unrealized expectations? Thoughtlessly and even recklessly throwing away a windfall? Thank you for visiting and for your kind words! i LOVE this post patti! the quote is awesome. great and healthy outlook! Thank you for stopping by, Martha! I'm certainly not where I expected to be at this time in my life, but that is honestly a good thing because it has turned out to be better than I expected. I learned the painful way that when I'm in control, I can make a real mess of my life. Letting go of the control, and following God has made my life better than I ever could have done it alone! Hi Patti - This is such a good point: that both the unexpected negatives AND unexpected positives require adjustment and wisdom. Nothing ever is quite what we expect; that shouldn't surprise us. 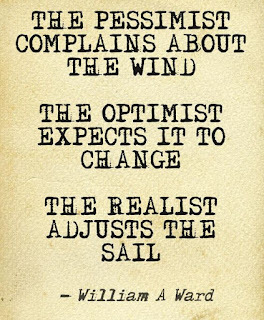 And yes, that IS a great quote about being a realist. The writer Parker Palmer says in Let Your Life Speak that God is a God of reality, not fantasy. He meets us in what IS, not what we want things to be. Thanks; I always appreciate what you write. 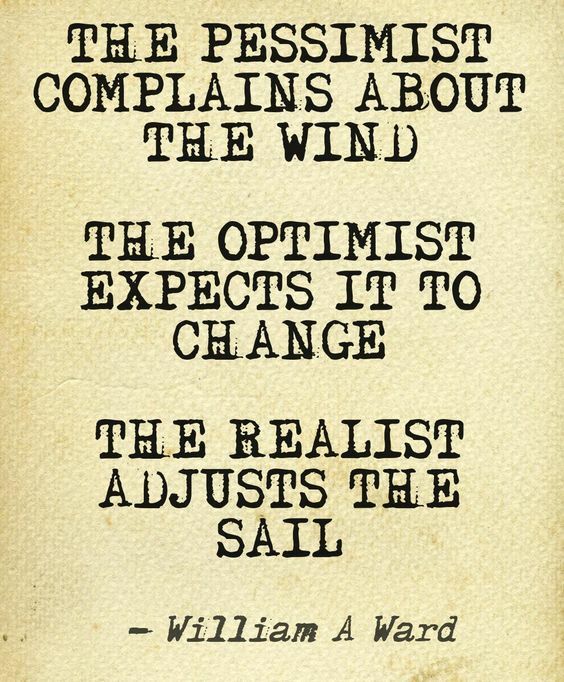 Great quote by William A. Ward, Patti. Thank you for sharing this! Thanks for stopping by, Karen! Yes! I've wrestled much with how life has not turned out how I expected. There is a time for grief but then you must put one foot forward. I know you, too, have encountered the unexpected. Adjusting the sail aptly describes what's necessary. Are you familiar with Facebook CEO Sheryl Sandberg's story? She now has a support group online called "Option B." She is really inspiring. First of all, I'm sorry you've faced this struggle and hope the situation is now better. No, I hadn't heard about her story or about Option B, but I will definitely check out both. Thanks!